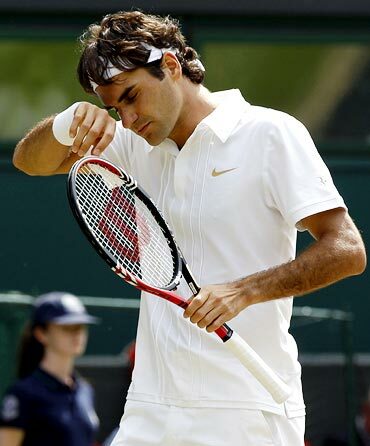 Roger Federer was bullied off court for the second time in a month on Wednesday but his Wimbledon exit at the hands of Czech Tomas Berdych could do much more significant damage to his psyche. For seven years at the All England Club the 28-year-old Swiss has been virtually unbeatable with only an inspired Rafael Nadal getting the better of him in an epic 2008 final. This year, however, Federer has looked strangely vulnerable from the opening round when he came within three points of defeat by Colombian journeyman Alejandro Falla. His five-set nailbiter against Falla was followed by a scratchy four-set triumph against Serbia's Ilija Bozoljac and although he turned on the style against Arnaud Clement and Juergen Melzer he was a forlorn figure against Berdych. After losing to Robin Soderling in the last eight of the French Open, Federer joked that at least his streak of quarter-final appearances at Grand Slams is still intact, having failed to chalk up a 24th semi-final run. That idle quip looked a little hollow on Wednesday when the six-times Wimbledon champion was a distant second best against Berdych, one of the growing number of baseline pounders who now walk on court believing they are Federer's equal. Federer, who was beaten 6-4, 3-6, 6-1, 6-4, spoke afterwards of back and leg pains but it will be the 16-times Grand Slam champion's pride that was causing him most discomfort as he faced up to the unpleasant truth that his aura of invincibility has gone, possibly for good. "God, I can't wait for Paris and Wimbledon to come around next year again, that's for sure," a downbeat Federer told reporters. "People think quarters is shocking, but people would die to play in quarter-final stages of Grand Slams." For a man who has spent a good chunk of the past decade as world number one and who expects to win every Grand Slam he enters that sounded rather like clutching at straws. Federer's game has lost some edge since he won the Australian Open in January, his last tournament victory. His groundstrokes no longer punch holes in opponent's defences and his serve, while still potent, is not the reliable weapon it was at the start of the year. But, most of all, his nerves seem to become a little frayed. Against Falla he even looked a little desperate at times. 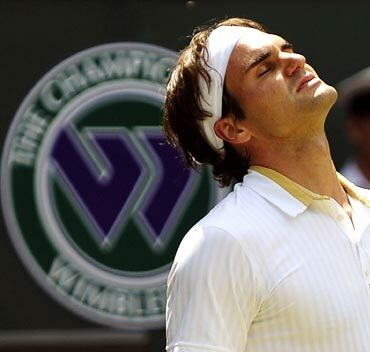 The air of tranquillity that has surrounded Federer since he made his breakthrough at Wimbledon in 2003 is missing. It is not just Wednesday's defeat to Berdych or the claycourt pounding that Federer suffered at the hands of Soderling that have raised eyebrows. In the build-up to Wimbledon he lost to Lleyton Hewitt, a player he had beaten 15 times in row, in the Halle final, for what was only his second defeat on grass in eight years. Scroll back through his results this year and his record is littered with defeats against the likes of Albert Montanes in Estoril, Ernests Gulbis in Rome, Berdych again in Miami and Marcos Baghdatis in Indian Wells. Even at the end of last year he lost to Russian Nikolay Davydenko for the first time in his career, a couple of months after Juan Martin del Potro had also posted a first win over the Swiss in the US Open final. "He put the bar so high, that losing in the quarter-final of two Grand Slams in a row is surprising," three-times Wimbledon champion Boris Becker told the BBC. "The question has to be asked did he lose a bit of motivation? Whatever it is it's not the Roger we've seen for so many years." Federer, who is married and has twin daughters, clearly has more to his life than tennis but still loves the challenge of a sport in which, at 28, he is closer to the end of his career than the beginning. Once rested and niggle free he may yet return to dominate the North American hardcourt swing and win a sixth US Open title. Pat Cash, another former Wimbledon winner was quick to reassure Federer fans that the great man is not washed up yet. 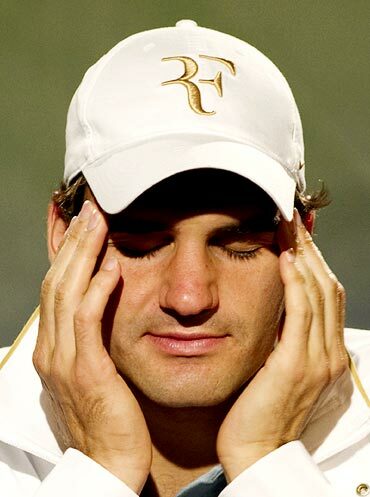 "We haven't seen the end of Federer," the Australian said. "He's not playing much worse, he just misses the occasional shot and doesn't come to the net any more. 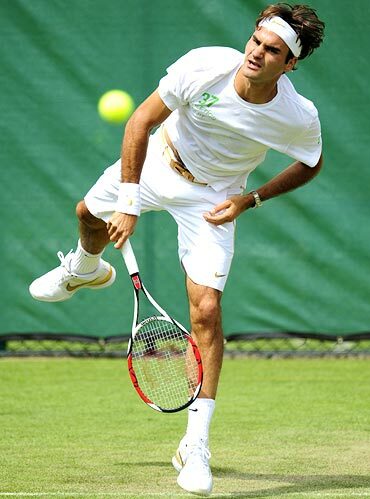 "But I'm convinced he will still win another Grand Slam, probably on hardcourts or here at Wimbledon."